Punch (and Judy! )… | Hey Bernice! I can’t drink alcohol this Christmas and New Years Eve (being Pregnant)… in fact, I can’t drink much at all. My list of approved beverages has diminished somewhat, to water and soda water, since being diagnosed with gestational Diabetes – temporary diabetes whilst pregnant! So for all those that can drink punch … this is for you! To provide a ‘special’ beverage this festive season for those who don’t drink or are pregnant, I have dug out the punch recipe from Truffleduck (where we were married). I didn’t try the punch on our wedding day, however one of our ‘foody’ guests requested the recipe afterwards – so it must have been good. 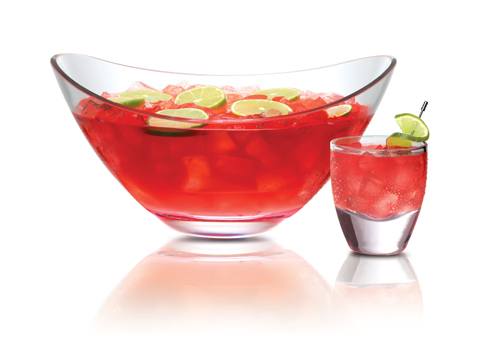 Naturally any punch can be ‘spiced’ up a little with the addition of vodka, or any other fruit flavoured alcohol. Happy fruit punching this festive season. I also like to add some fresh fruit to my punch – try some grapes (frozen ones are great), watermelon (balls look good), and sliced strawberries. The easy way to add fruit is to place a can of fruit salad in there! Pingback: An Australian Christmas menu… « Hey Bernice!